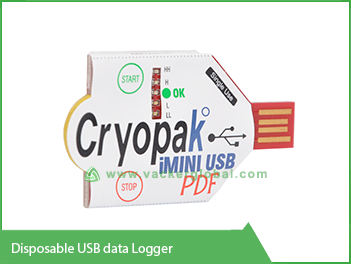 A single-use USB data logger is a device that is used for recording measured data of various parameters such as pressure, temperature, humidity, etc. The recorded data is transferred to the PC by connecting the device through a USB interface. There is a USB port in the computer and another port in the device. These two are connected with the usage of connecting cable. We supply a variety of USB data loggers for various purposes. There is a list of USB data loggers that Vacker KSA has in offer. 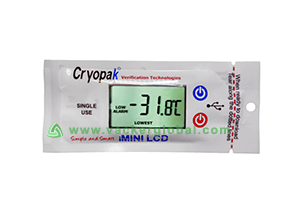 We supply USB temperature data logger, USB humidity data logger, USB pressure data logger and many more. These devices are used in various applications such as cold chain management, chemical and biological science and a number of other industries. The first one is the single-use USB data logger. The users can use it only once and once this device is used, it cannot be used again. It can be used once for recording and measuring of data. Afterwards, it can be disposed. Hence this is how it gets its name ‘Disposable USB data logger’. The prime application of this device is for transporting medicines, food, blood, etc. These data loggers can be used multiple number of times. The recorded data is transferred to the PC through the USB interface for further processing and analysis. The memory of this type of USB data logger is emptied for reuse. There are two types of multi use USB data loggers in this series that Vacker KSA has in offer for you. One is for the purpose of recording temperature only while the other one is used for recording both temperature and humidity. These are the simplest of single USB data loggers that Vacker KSA has in offer for the valuable customers. We supply these and other single-use USB data loggers to major cities of Saudi Arabia including Riyadh, Al Khobar, Dammam, Jeddah, etc. 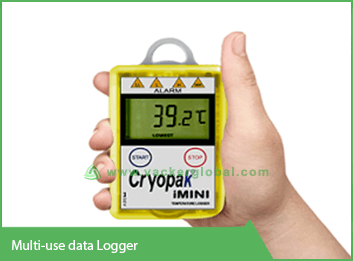 This data logger is very easy to use. It can simply be plugged in and is ready for use. No dedicated software is required for its installation and the report of the recordings can be downloaded directly in 3 different formats: MS-Excel, Adobe PDF and text reports. You can view all the 3 reports once you plug the USB data logger into your PC for the device resembles similarity to a USB memory stick. It has a start and stop button in order to start or stop a data recording. There are 5 different LED displays for displaying various alarms. It can record up to 7928 readings. The device can be programmed at recording for several days like: 15 days, 30 days, 45 days, 90 days etc. The recording interval can also be programmed manually as per your requirement. It can auto generate reports in 3 formats: MS-Excel, PDF and text format. Green LED – the reading has not exceeded limits (either higher or lower). First Red LED above green LED – the reading has exceeded the first high level of alert. Second Red LED above green LED – the reading has exceeded the first and second high levels of alert. First Blue LED below green LED – the reading has gone below the first low level of alert. Second Blue LED below green LED – the reading has gone below the second low level of alert. This model is more of an economical model from Vacker KSA. It comes with an internal calibration report. When you plug this device to your PC, the last page of the entire report will show the calibration report. Highest and lowest of readings that are recorded. Timings for the highest and lowest readings were recorded. Similar to models of USB data loggers, Vacker KSA supplies 2 more models with calibration report. This model of data logger has the NIST traceable 3 point calibration report, which is carried out on each of the data logger. These data loggers are similar to the singly use USB data loggers. The single-use data loggers can measure temperature, humidity or pressure at a time but the multi use USB data loggers can record more than one parameter at a time. These USB data loggers are relatively larger in size in comparison to other USB data loggers. These data loggers have a larger LCD display and also have higher memory capacity. These devices can record parameters like: temperature, pressure, humidity etc.